DuPont KEVLAR®* is an extremely strong composite material favored by many competition, sport and high-power fliers. Great strength plus high resistance to heat makes Kevlar an ideal shock cord anchor. The breaking strength of KEVLAR®* is five times that of steel wire! The 28 pound test is good for high strength shroud lines. All listings of tensile strength are approximate. Kevlar® Thread 28 Lb tensile strength. Five Yards. Kevlar® Thread 28 Lb tensile strength. Ten Yards. Kevlar® Thread 28 Lb tensile strength. Twenty-Five Yards. Kevlar® Thread 28 Lb tensile strength. 300 Yard Spool. Kevlar® Thread 60 Lb tensile strength. Five Yards. 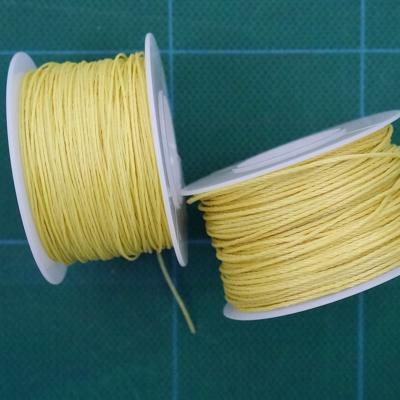 Kevlar® Thread 60 Lb tensile strength. Ten Yards. Kevlar® Thread 60 Lb tensile strength. Twenty-Five Yards. Kevlar® Thread 60 Lb tensile strength. 100 Yard Spool. Kevlar® Thread 130 Lb tensile strength. Five Yards. Kevlar® Thread 130 Lb tensile strength. Ten Yards. Kevlar® Thread 130 Lb tensile strength. Twenty-Five Yards. Kevlar® Thread 130 Lb tensile strength. 66 Yard Spool. Kevlar® Thread 225 Lb tensile strength. Five Yards. Kevlar® Thread 225 Lb tensile strength. Ten Yards. Kevlar® Thread 225 Lb tensile strength. Twenty-Five Yards. Thank you for the nice kits. Your kits and service are exceptional. - Steve S.